H10 Meloneras Palace Beach is located just a 15 minute walk from the centre of Meloneras, on Gran Canaria’s south coast. The nearest beach is 100 metres away and offers the golden sands and clear seas the island is known for. 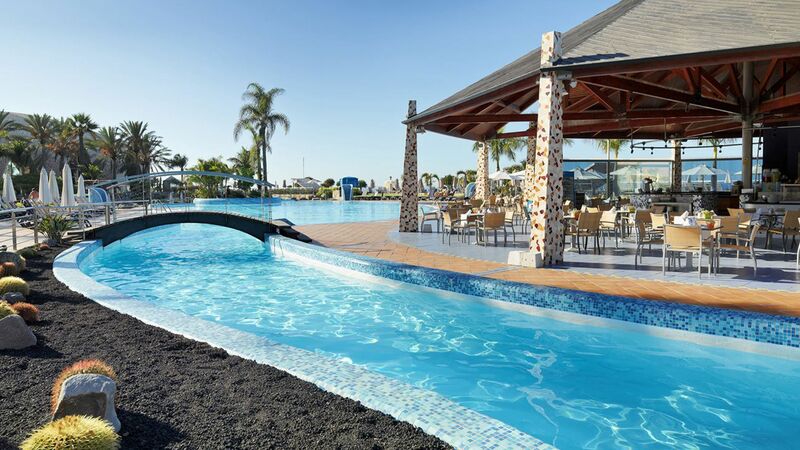 At the hotel itself you’ll find pretty gardens home to a selection of three swimming pools, one infinity and one just for children, as well as a choice of bars. Spend the days trying out activities like tennis and basketball, or unwinding at the spa or in the Balinese beds which surround the infinity pool. 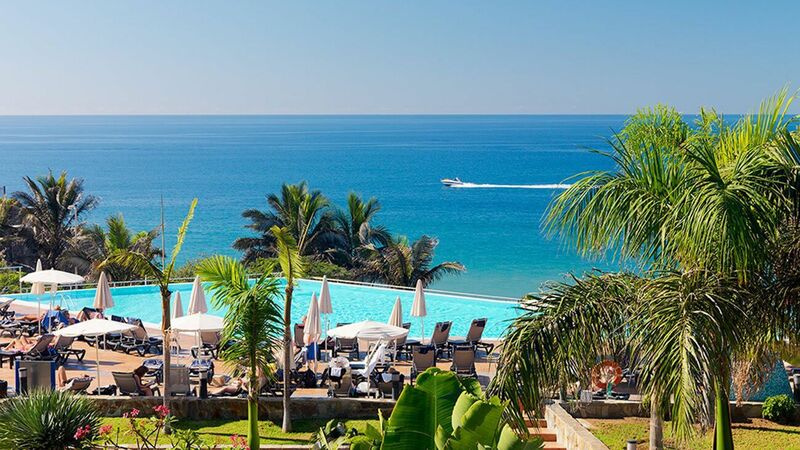 Take in views of the sea from the hotel’s gardens, or head down to the beach. 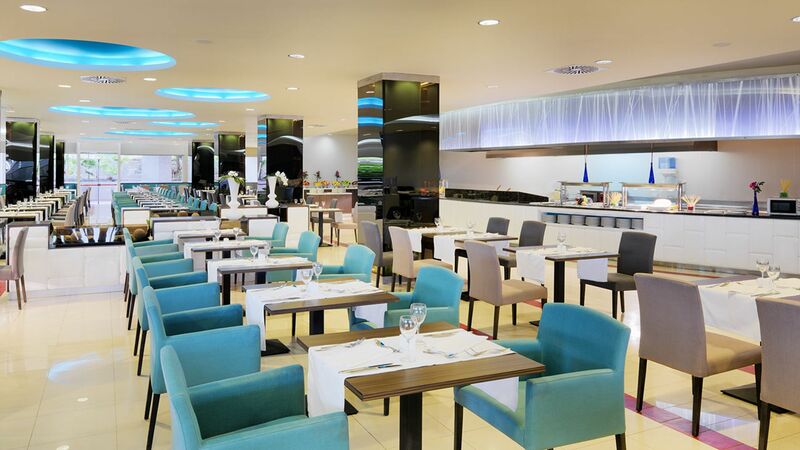 When it comes to dining you’ll be spoilt for choice, with light bites and refreshments available throughout the day, as well as gourmet á la carte meals and an extensive buffet. Hotel child prices apply to ages 2-11 years. The hotel has 374 rooms. Enjoy a delicious buffet spread in modern interiors or on the bright outdoor terrace. Dishes include Mediterranean and international favourites, as well as themed corners. The dress code for dinner is Smart Casual. No swimwear is permitted and men must wear long trousers and a shirt. 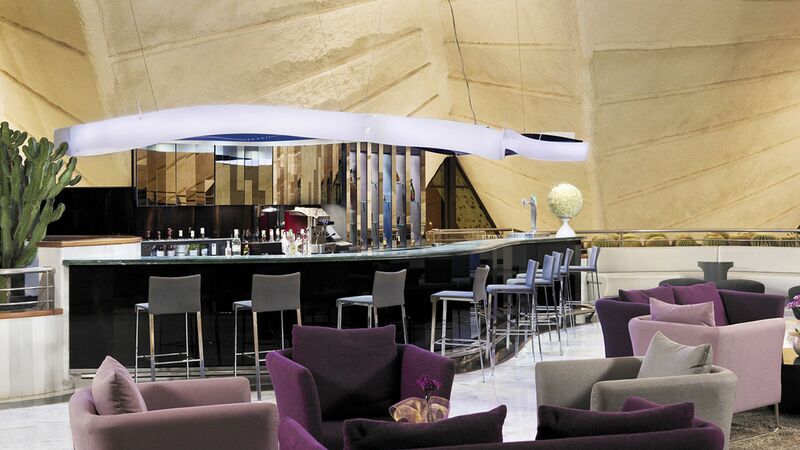 Unwind with a drink in this elegant bar and enjoy excellent local bands as they play live music. This poolside bar provides a pretty outdoor terrace with views of the swimming pool. Snacks, light bites and refreshments are served throughout the day. H10 Meloneras Palace Beach’s main á la carte restaurant provides delicious seafood and Mediterranean options, as well as an extensive drinks menu. The dinner dress code is Smart Casual. No swimwear is permitted and men must wear long trousers and a shirt. Take in spectacular views of the swimming pool and sea from the relaxed terrace. The bar offers live music and shows on selected evenings. Evening entertainment and a dance floor make this the perfect place to relax in the evenings. There’s also an extensive drinks menu. The nearest golden sandy beach is just 100 metres from the hotel and offers water sports, sun loungers and parasols. There are two heated outdoor swimming pools for adults. One is surrounded by the beautiful gardens, while the infinity pool offers views of the sea. There is also a separate swimming pool for children. The Kids’ Club offers a range of activities and games all day, keeping your little ones active and having fun throughout their stay. The mini disco allows little ones to dance, have fun and make new friends in the evenings. Dance classes and cocktail making lessons are the ideal way to spend an hour trying something new. Guests of all ages will love the live music and shows held after dinner at the hotel’s three bars. The hotel offers a range of sports, including tennis, basketball and aqua aerobics. Keep fit and active at the H10 Meloneras Palace Beach and enjoy a wide range of cardio and strength equipment. 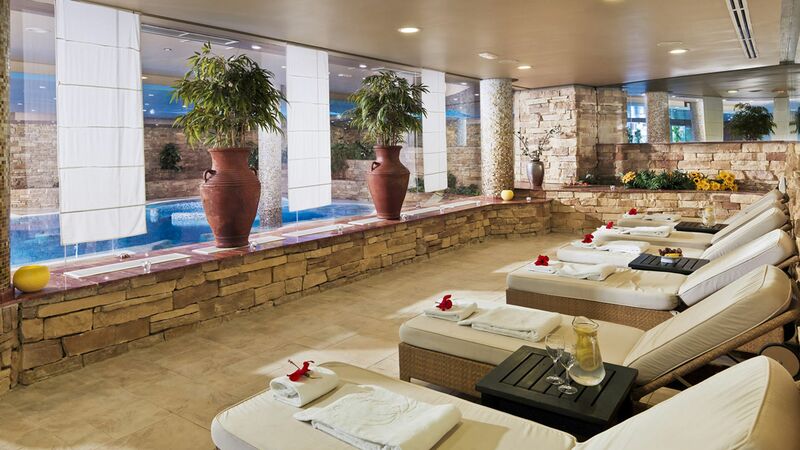 The spa complex is a relaxing space featuring an indoor pool, hydromassage beds, a Jacuzzi, sauna and Turkish bath, as well as an ice fountain. Guests can also book treatments such as massages and wraps, and there are hairdressing facilities as well. H10 Meloneras Palace Beach is located in Meloneras, along the south coast of Gran Canaria. It’s just 100 metres from a golden sandy beach, where you can spend the days relaxing on sun loungers or taking a cooling dip in the crystal clear waters of the sea. Water sports are also available here, with boat trips allowing you to explore the coast and find your own secluded bay. The centre of Meloneras is just a 15 minute walk away, and offers a wide range of chic bars, upmarket restaurants and designer shops. This purpose built resort is the ideal place for a stylish beach holiday in the sun. H10 Meloneras Palace Beach is a 25 minute drive from Gran Canaria Airport. These bright and spacious rooms have a double bed, with free Wifi, air conditioning, a television and a safety deposit box. There is also an en suite bathroom with a combination bath and shower, a bathrobe, slippers and a hairdryer. These light rooms have large windows with beautiful sea views, as well as a double bed, air conditioning, free Wifi, a television and a safety deposit box. The en suite bathroom has a combination bath and shower, as well as a hairdryer, bathrobe and slippers. These large rooms offer a spacious furnished balcony with sea or garden views. There is a double bed or twin beds, a pillow menu, air conditioning, free Wifi, a television and a safety deposit box. The en suite bathroom has a combination bath and shower, as well as a hairdryer, bathrobe and slippers. Guests staying in Privilege rooms can also enjoy breakfast and dinner at the á la carte restaurant, personalised service, Balinese beds by the pool, free parking and more. These spacious suites have a separate living room with a seating area and TV, a spacious furnished terrace with hammocks and a bedroom with a king size bed. Enjoy sea or garden views, as well as two TVs, air conditioning, free Wifi, a safety deposit box and a minibar. The en suite bathroom contains a separate bath and shower, a bathrobe and slippers and a hairdryer. Save up to 10% on the hotel price for holidays between 01 June - 31 October 2019 booked by 30 April 2019. Save up to 10% on the hotel price for holidays between 01 November 2019 - 30 April 2020 booked by 31 August 2019. We stayed at the H10 Playa Meloneras Palace from April 5th to 12th. The hotel location, facilities, food, staff and accommodation we five star in all respects, We were amazed at the high standard of food and the quality of the - heated - pool areas. The ambience and the style of the building were outstanding and just chilling by the infinity pool was luxurious. A WONDERFUL HOLIDAY. Five star all round - we will be back! Stayed for one week all inclusive April 2019 loved it even more than our first visit. Cannot fault anything with this hotel the service and cleanliness is second to none. I emailed the hotel requesting a high room and they didn?? ?t disappoint we had a room on the seventh floor very close to reception exactly what we had asked for. The hotel pool area is amazing and the infinity pool spectacular we had brilliant service throughout our visit in all areas the dinning room the pool side bar and the bar at night. Rooms were cleaned daily no problems at all during our stay. Would we stay again YES in a heartbeat can?? ?t wait to go back. Amazing holiday only one regret wish we had booked longer. Just spent one week here now. Not coming back! Really nice and clean hotel and good service in the staff. BUT..... If you are hungry and want to eat in the dinner buffet they have a dress code. No shorts allowed! What is that ?? We are in Gran Canaria. Around dinner time it?? ?s 25 degrees Celsius... Come on guys. It?? ?s a shabby dinner buffet.. And if you have a walking disability, DO NOT COME HER. The hotel is to big. From the reception area you have 3-7 minutes walk to your room. Thums down! The hotel is lovely. Easy access to the beach and the seafront. Our room was very clean and tidy. The outdoor areas are tidy and a pleasant place to be. The food was great. Staff very helpful all the time. Will definitely go again.